thank you for the copy of your watercolour, I have not seen it before. The Everton Lock up or Prince Rupert's Tower appears in Everton FCs logo and was a place that was used to lock up the wayward or drunks etc. 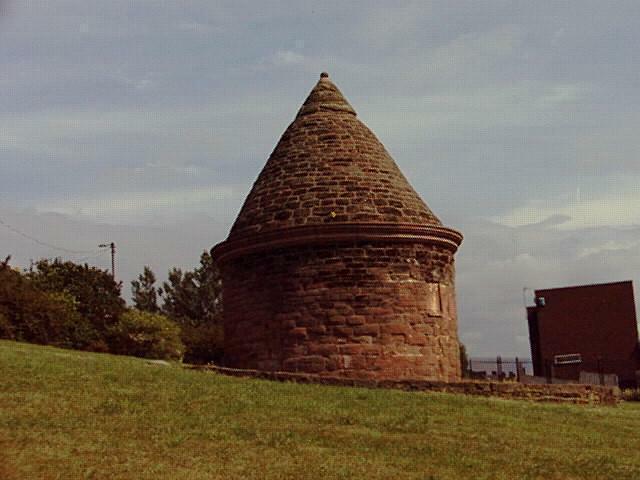 The Official Crest of Everton Football Club, arguably one of the best in the English league, features the tower erect (in heraldic parlance), bordered by two wreaths resplendent. 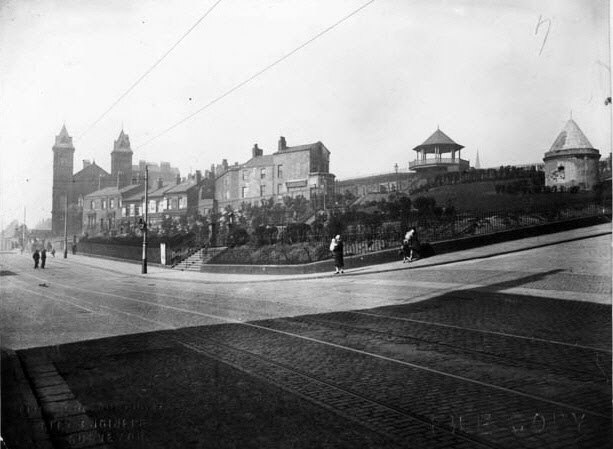 Prince Rupert's Tower, or The Roundhouse, that is identified so strongly with Everton, asmentioned is an old Bridewell or lock-up that is still located on Everton Brow, in Netherfield Road, Everton. It was built in 1787, and was used to incarcerate wrong-doers until they could be hauled before the magistrate the following morning. 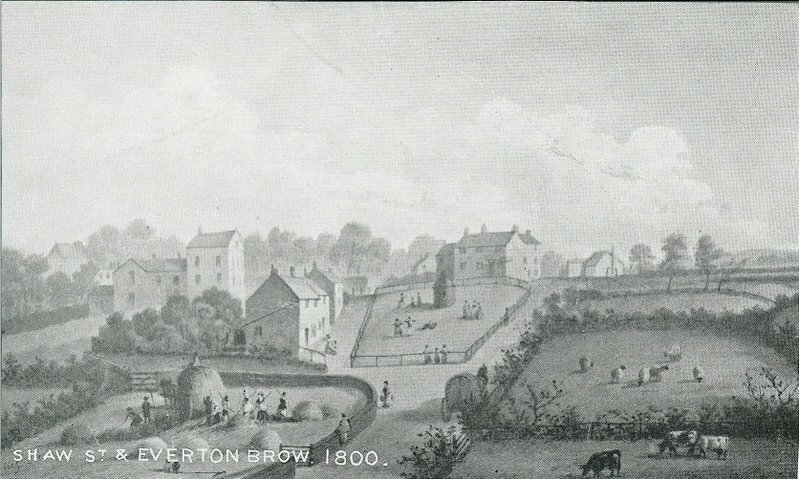 An early print of Everton Brow by Liverpool artist Herdman in 1800 shows the small round house with a conical roof in the middle of the penfold (cattle enclosure). Also going by the nicknames “Stewbum's Palace” or the “Stone Jug” in its day. There is a display about the lock-up in the Liverpool Museum. Ye Anciente Everton Toffee House was located by the Queen's Head Hotel in Village Street, where much of Everton's early development occurred. The Toffee House was the operation of Old Ma Bushell, who was the original Toffee Lady, and actually invented Everton Toffees. This confectionery was sold in huge quantities to the hungry hordes as they journeyed from far and wide to watch Everton play in the new Football League, firstly in Stanley Park, and Priory Road. Then at Anfield, Everton's third ground. Mother Nobletts Toffee Shop was located near Goodison Park, and figured prominently after the move from Anfield in 1892. Old Mother Nobletts was placed on the horns of a dilemma when that momentous decision was taken to move the great club from Anfield to the new Goodison Park. But, being the mother of innovation, Mrs Nobletts hit upon a great idea as direct competition for the Everton Toffees patented by her arch rival, Old Ma Bushell. Mother Nobletts invented Everton Mints. Everton Mints were a great success with the crowd. The black & white stripes of the new sweets reflected an older strip that Everton had worn some years earlier. Meanwhile, sales of Everton Toffee from Ye Anciente Everton Toffee Shop declined rapidly, mainly due the long distance that now separated Old Ma Bushell's tasty goods from the crowds milling around Goodison Park. Not to be out-done by the inventive Mrs Nobletts, Old Ma Bushell pulled a masterstroke of marketing acumen. She gained permission from the leaders of the Club to distribute her Everton Toffees to the crowd inside the ground as they waited patiently for the kick-off. Her beautiful young grand-daughter, Jemima Bushell, was persuaded to perform this honourable task. She dressed in her best finery, and donned a broad hat before carrying around her basket laden with individually wrapped Everton Toffees. And so was born the tradition of the Everton Toffee Lady, a pre-match feature at Goodison Park that has lasted remarkably well down the years. In previous years, one Toffee Lady did the job week-in, week-out: Mary Gorry fulfilled this role in the mid-Fifties. Nowadays, for each home match, a different teenage girl is selected from the ranks of Everton's Supporters Club to perform this time-honoured task. I have enclosed some photos of the lockup.